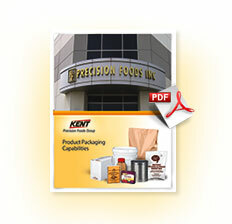 Offering customers numerous packaging options, Kent Precision Foods Group’s horizontal and vertical form filled and sealed packaging machines can pack products using elaborately designed preprinted film or value-conscious one-color film, featuring simple in-line printing and everything in between. A variety of bag sizes are available with pack weights ranging from 1 oz. to 6 lbs. Dual fill capacity on horizontal form filled and seal line minimizes reduction in particulate size throughout filling process.